Geomembranes are the most widely used products for solid waste containment (such as landfill liners), mining and water containment applications. Geomembranes are available in a variety of physical, mechanical, and chemical resistance properties designed to meet the requirements of a wide range of applications. These products are engineered to help provide cost-effective solutions and to meet specific design requirements in fluid barrier, containment and other geotechnical applications. 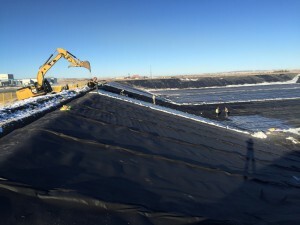 Western Tank & Lining (WTL) has over 28 years of experience in the installation and fabrication of geomembrane liners. We also offer maintenance and repair support for your installation including regular inspections, cleaning, leak detection and repair. WTL supplies and installs the highest quality geomembranes in the industry with a wide selection of products.